Mobile apps have less space to lay out menus and buttons and as a result it’s not always obvious how to do certain tasks within an app. Case in point: Bringing back tabs you’ve recently closed on the mobile version of Safari. Here’s how to do it with just a few taps. By tapping the tab button in the lower right corner of Safari you can bring up open tabs, and then the plus icon lets you create a new tab. However, if you tap and hold the plus icon, all your recently closed tabs appear, letting you bring back any that you didn’t mean to close. 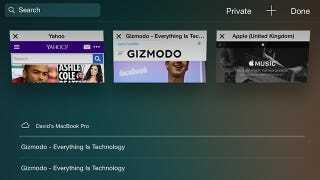 If you’re using an iPad or an iPhone in landscape mode, the plus icon is already on the main Safari interface and there’s no need to view the open tabs first—just tap and hold on the plus icon and your most recent tabs show up. If you didn’t already know how this was done, consider yourself enlightened.